COMMENTARY — We have all heard the old tale about the tortoise and the hare —well that was pretty much the story of Saturday night’s game between Utah and USC. The Utes were methodical and controlled the clock, whereas the Trojans were opportunistic and swallowed up yards in large chunks. Both approaches had merit, but only one would carry the day. In the end, steady and sure beat out fast and brash. Year after year, Kyle Whittingham has consistently praised USC as the most talented team in the league, including the current squad. That talent was on full display against Utah by a number of Trojans destined to play on Sundays. Adoree Jackson ran a kickoff back 100 yards for a touchdown and nary a Ute even got near him. JuJu Smith-Schuster hauled in eight passes for 98 yards. New freshman starting quarterback Sam Darnold had quite a coming out party himself. However, the greatest performance by a man of Troy wasn’t even by a Trojan, but rather it was Utah’s own Troy Williams. While this was a signature win for the Utes as a whole, it was a defining moment in the progression of Williams as a top-notch quarterback rather than a mere game manager. Especially in the fourth quarter when the game was on the line, Williams just kept getting better, and better, culminating in a pinpoint pass to Tim Patrick for the winning touchdown. It was somewhat reminiscent of watching a young Andre Miller grow and progress with each possession in his first few games as the point guard piloting the Runnin’ Utes basketball team. If Williams ends up having even half the career that Miller had, then Utah football is in good shape for the next few years. 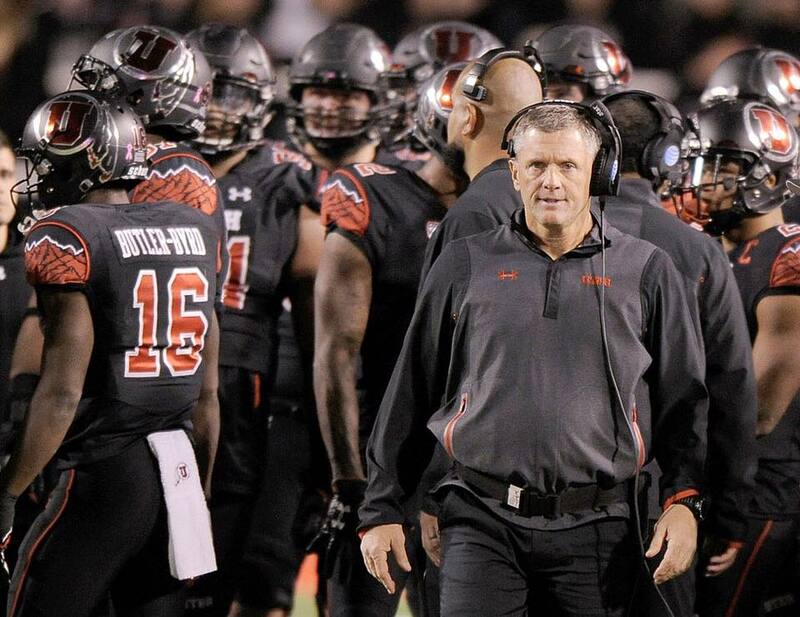 Kyle Whittingham made some great coaching decisions for the Utes Friday night. The impact of coaching on the game’s outcome cannot be understated. One very important example involves identical situations by both coaches in the fourth quarter, with a different decision made by each coach which arguably determined the ultimate outcome. Ironically, in a reversal of roles from the game to that point, when the game was on the line the Trojans hit the brakes while the Utes went full throttle. Facing fourth down and 3 yards to go at Utah’s 25-yard line to start the fourth quarter, USC coach Clay Helton opted for a field goal to push the Trojans’ lead to 27-17. Utah then scored a touchdown to close the gap to 27-24. The Trojans drove into Ute territory once again, and with fourth down and 3 yards to go at Utah’s 37-yard line, USC opted to punt. On Utah’s final drive of the game, the Utes were faced with fourth-and-1 at the Trojans’ 35-yard line. Foregoing an opportunity for a long field goal, Utah gained 3 yards for a first down. Four plays later, the Utes once again had a decision to make on fourth down with 1 yard to go at USC’s 23-yard line. This was a prime opportunity for a very makeable 40-yard field by “Automatic” Andy Phillips, which would tie the game and likely result in overtime. Once again, Whittingham opted to go for it instead, and Utah converted the fourth down (for a perfect 4 for 4 on fourth-down conversions for the night). The next play was the touchdown pass from Williams to Patrick, giving the Utes a 4-point lead and only leaving 16 seconds on the clock for one last desperation play by the Trojans. I will be the first to admit that there is a difference between needing one yard and three yards for a first down. Nevertheless, Whittingham showed confidence in his players on the definitive drive of the game not just once, but twice, and gave them a chance to win — which they did. When USC was looking to hire a new coach to replace Steve Sarkisian, rumors abounded that Whittingham was on the short list. Who knows if Whittingham would have even accepted the job if offered, and thankfully Utah fans will never know. I bet a lot of Trojan fans are wondering “what if” after last Saturday’s game. Next up for the Utes are the California Golden Bears on the road in Berkeley this Saturday, kicking off at 4 p.m. This will be the next step toward a Pac-12 South Division title. National rankings are nice (Utah is currently ranked No. 18 in both the AP and Coaches Polls), but the prize on which the Utes have their eye is a conference title. Utah, Arizona State and Colorado each notched wins against North Division teams to sit atop the South Division standings at 1-0. There is still a lot of football left to play, but the Utes are currently sitting in the pole position in the South. Notably, Stanford has already beaten both USC and UCLA, Colorado and Arizona still have to play the Cardinal, but neither Utah nor Arizona State play Stanford in the regular season. Arizona State still has to play both USC (this weekend on the road in the Coliseum) and UCLA (at home the following week). Colorado also has to play both L.A. schools. UCLA is the only one of the three California powerhouse teams left on the Utes’ schedule. The bottom line is that Utah controls its own destiny, and the schedule is in its favor. Here’s hoping the Utes keep marching toward a Pac-12 South title this Saturday with another win over Cal on the road.